paid till 30th of March 2015! 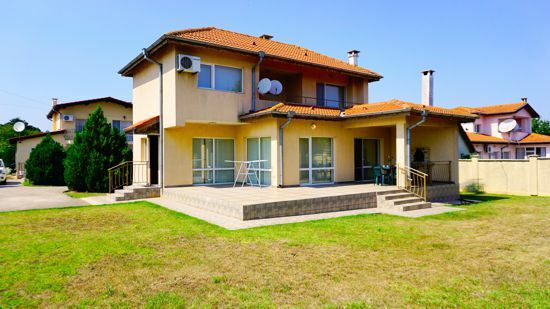 This villa is situated in a nice small complex. The house is detached from the other 3 villas in the complex and has its own privacy. 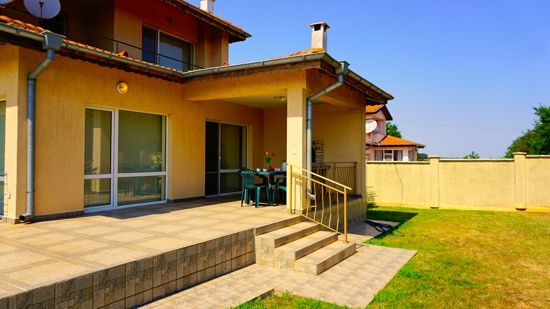 It is a perfect location for summer holidays – in a well developed village, named Sokolovo /the name comes from the word “falcon”/, which is only 8 kilometers from the famous tourist town of Balchik with its beaches, restaurants, coffee bars and many other entertainments. 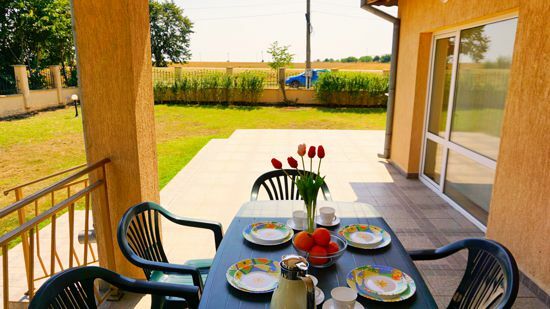 The villa is offered three bedrooms – two on the second floor and one on the ground floor. The Master bedroom is with double bed, night tables and lights and has the benefit of a small balcony looking to the garden. The second bedroom /children’s room/ is equipped with two single beds, chest of drawer and a wardrobe. Downstairs bedroom is with double bed, night tables and lights, wardrobe and a baby bed. 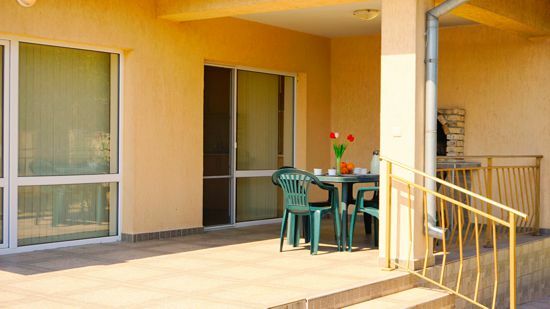 All rooms are sunny and lighted with nice vertical blinds and air-conditioners. Linens and towels are provided. A bathroom with a shower-cabin, sink and WC is servicing the second floor bedrooms. An open plan living with comfortable sofa-bed, armchairs and coffee table will contribute your relaxation in front of the TV set and the Satellite with many English programs. 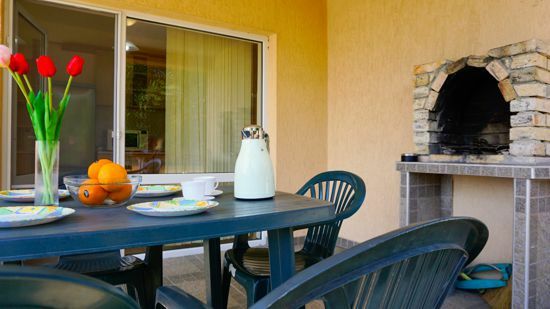 As the villa is self-catering, there is a modern fully fitted kitchen /including fridge-freezer, oven, hot plates, dishwasher, washing machine, microwave, toaster, all necessary pottery/ and a dinning area with table and six chairs. 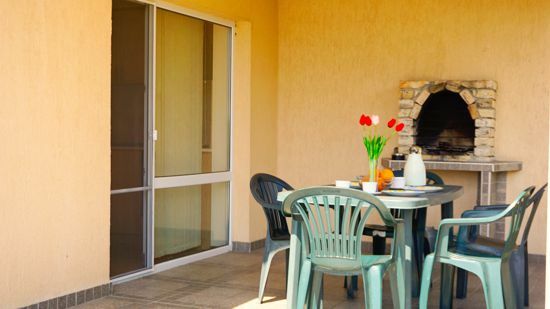 French doors are leading to the private garden and a patio with BBQ. - Varna City - 32 km. 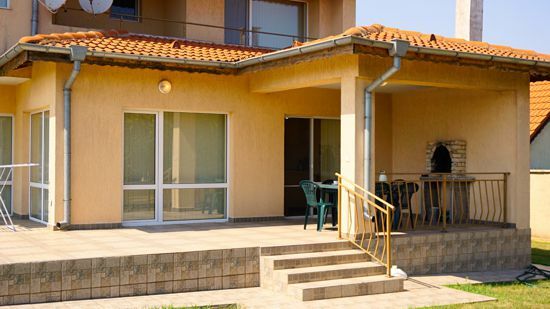 - Balchik town – 8 km. 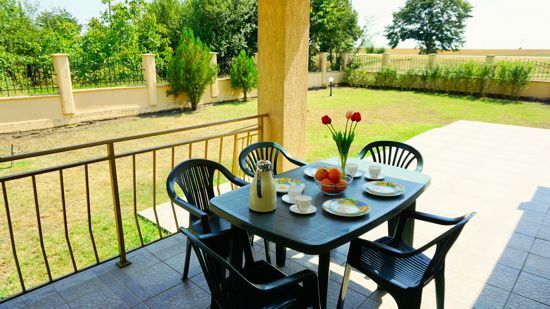 - Kavarna – 19 km. 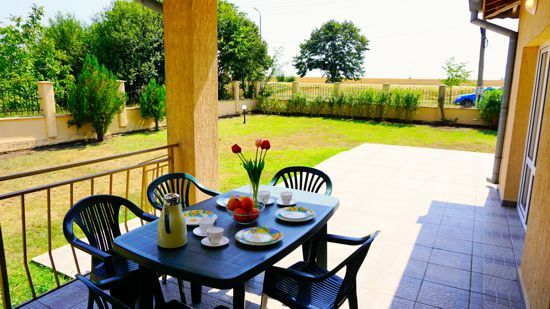 - Albena Resort – 10 km. - Golf Courses - 5 km.